Laura Jackman, right, receives award. Photo courtesy of CBEEN. 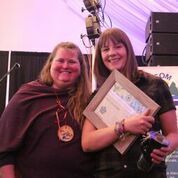 Rossland’s Laura Jackman is one of the educators who took home awards from the 2018 Canadian Environmental Education Conference. The awards ceremony, which took place on October 20 at St. Eugene Mission Resort, recognized both classroom teachers and community educators who demonstrated excellence in encouraging stewardship and sustainability through environmental education in the Canadian Columbia Basin. Nominated by their peers, and chosen by a committee of past recipients, their experience, collaborative efforts and mentorship have made a positive impact on our entire region. Besides Jackman, other award recipients were Courtney Haeusler (Fernie), Dawn Deydey (Fernie), Janene Stein (Balfour), Joan Dolinsky (Golden), Katrina Sumrall (New Denver), Kristina Leidums (Creston), Mardelle Sauerborn (Sparwood) and Sheena Stienstra (Castlegar). In addition, the local region brought home two Canadian Awards of Environmental Education Excellence. The Kootenay-Boundary’s School Superintendent Environmental Education Initiative was recognized for their work in supporting place-based learning in schools around the region. And CBEEN’s Executive Director, Duncan Whittick, received the national award for outstanding individual supporting an organization in Canada.